The idea formed quite early on in my TCV Natural Talent Traineeship based at the Royal Botanic Garden Edinburgh to develop a specific tool kit to help people engage with the concept of ‘biodiversity leading to environmental & human well-being‘. The ‘tool kit’ uses lichens as indicators of air quality to help us explore the links between people, place, lichens, air pollution and active travel. It is long been documented that the humble lichen is highly sensitive to various air pollutants. 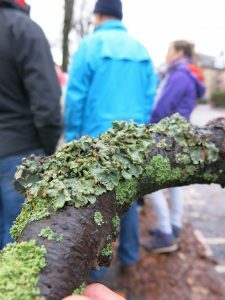 During my traineeship I have been exploring how air pollution, in Edinburgh and surrounding areas within the eastern central belt of Scotland, affects lichen populations and lichen species growing on the trees within our urban areas. The aim was to discover what the lichens we do or don’t find can tell us about our local air quality. 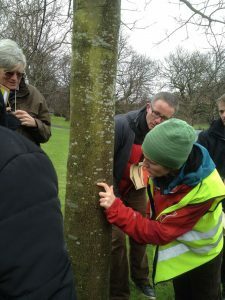 Lichens – Making the Invisible Visible – An Air Pollution Survey. (To download a copy of the survey please click link above) Note: You can do this survey at anytime because lichens can be found throughout the year. To find out more about lichens & air pollution click here. The survey is an introductory level survey, aimed at individuals, community groups, families, and anyone interested in exploring their local air quality – which may then lead into doing the OPAL Air Survey. The survey links directly to where people are, to their local areas, local pollution sources and their local air quality. Using experiential learning (learning through exploring, experiencing, creating, discovering, relating to and interacting with the world around us), the survey gets us to really explore the air we breathe, our local areas (through physical and sensory mapping), local sources of air pollution, and doing a very simple lichen ‘hunt’. It then helps us to explore how we can help improve our local air quality & also work towards reducing CO₂ emissions by taking part in Active Travel (walking, cycling, public transport – supported by Sustrans). 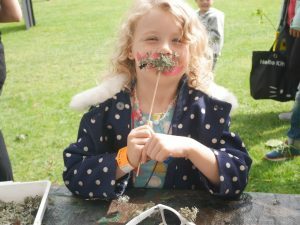 This is a citizen science survey which focusses on process – exploration, discovery, sharing and critical thinking, which aims to enable increased awareness of our local areas and the impacts of our actions, leading to positive behaviour change. In this survey the ‘results’ of the lichen hunt are not uploaded onto a national data set but are immediately fed back to the individual/groups conducting the survey. 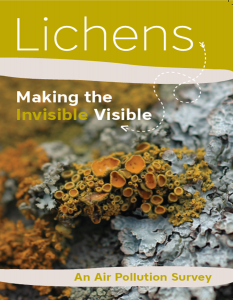 Lichens are everywhere “right under our noses”! The survey can be completed in single short session or several lessons/sessions could be developed around the themes explored. Activities within survey can cover Experiences & Outcomes of literacy, numeracy and health & wellbeing—engaging the subjects of Science, Expressive Arts, Social Studies and Health & Wellbeing. This survey could also be used as part of a John Muir Award.